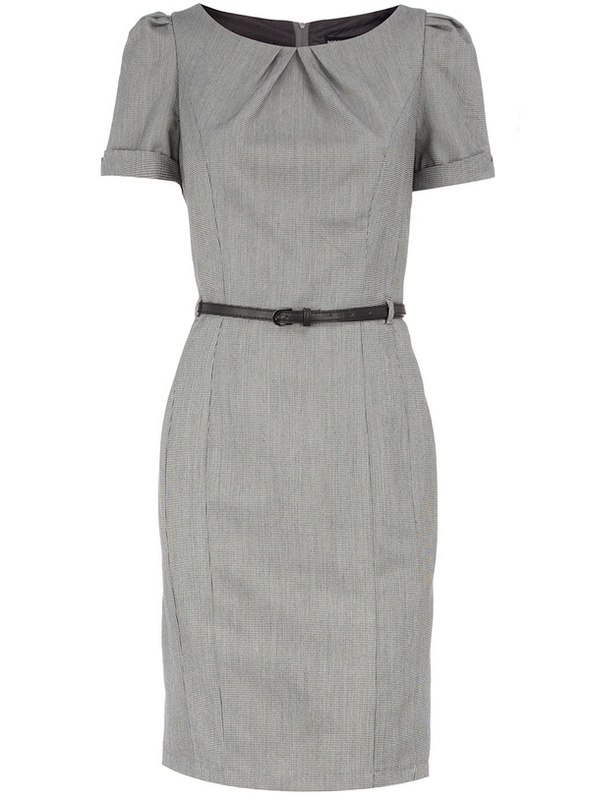 On one of the many Canada stops, the Duchess wore this grey sleeved Catherine Walker sheath. What's interesting about this dress are the cuff details on the sleeves and the exaggerated collar detail on the front, which is repeated on the low back. I love this sort of "professional business girl" style on her since she's never really worked and only now and then in royal duties do we get to see that side of her. But I do have to say, this sheath is also not my favorite on Kate. One reason is that it has such a lovely and interesting neckline and back detail that she is refusing to show off since her hair really covers it up, both the front and the back view. I would have preferred her in a looser pony in this dress. Second is that I think the whole looks is just a bit blah: grey dress and beige accessories. Its nice, its just not much to look at or very interesting. Lastly, I just don't think the style of the dress favors her shape. Sure she looks slim, but once again her shoulder line is very strong here, leaving her hips to just flatten in comparison. The princess seams do add a bit of shape, but they don't help proportion her figure. An A-line would have not only helped her proportions but it also would have made the dress just a bit more interesting I think. I can find very little information on Catherine Walker designs, except that her work is primarily bespoke, meaning entirely custom made and tailored for her high-end and exclusive clientele. Price estimates for this will easily run into the hundreds. Obviously custom pieces are harder to repli-Kate but what we want is a strong structured dress with a bit of a neckline detail in a neutral business fabric and silhouette. Much to my surprise I came across this Dorothy Perkins dress as a perfectly suitable candidate. It is a grey sheath dress with slim silhouette in a "dogstooth", which appears to be just a miniature version of a houndstooth print. My favorite details are the pleated neckline, which mimic the collar effect of the original inspiration, as well as the cuffed short sleeves, which are spot on the original. This dress currently retails for approximately ₤38, or $69 U.S.
Dorothy Perkins - mini dogstooth belted dress.